I have found a new holy grail when it comes to make-up. Well, actually when it comes to taking make-up off. I introduce to you the MAC Cleanse off oil. If read my blog on a semi regular basis than you know that I use a lot of waterproof make-up, especially waterproof foundation. Which is hard to take off at the end of the day. I used to use make-up wipes but I had to really scrub hard to take off very little. My skin recently started to break out really bad so I thought to myself 'this scrubbing to get my make-up off can never be good for my skin'. So I went to my local MAC store and asked the lady who worked there about it. I also told her that my skin is very sensitive and most products make me break out. She recommended me the Cleanse off oil Tranquil. I had heard some stuff way back in the day about this oil but never really thought about it. So I decided to give it a try. When I came home I saw that this product is really expensive, I didn't notice it in the store because I also bought some make-up. Even with my 40% off MAC Pro discount it was still €18, for those who aren't good at math without the discount the bottle is €30. I thought to myself this product must be REALLY good. It turned out this product is REALLY good. You only need a little and it instantly melts off your make-up. Even a heavy smoky eye is gone in seconds. 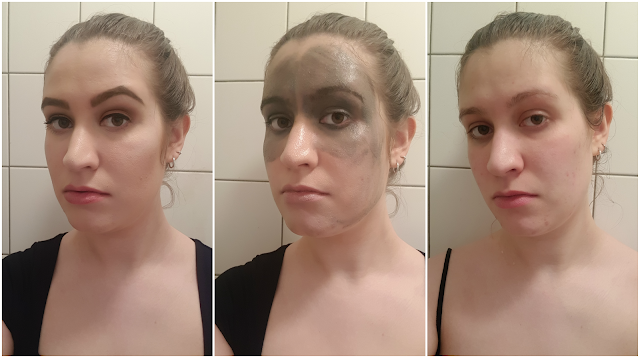 I decided to use photo's to explain how I use the product and show how good it works. I do have to apologise for the quality of the photo's. I normally don't take photo's with my phone and I normally don't use a lighting that's this crappy. I first massage a little bit of oil on my face, yes also on the eyes. I then rinse it off when I take a shower. I do check the mirror if there is still some make-up left, sometimes there is and then I just apply more oil. After I come out of the shower all my make-up is gone and my face is soft and hydrated. I then follow up with my evening skin routine. This is so much better than me scrubbing my face to get a little bit of foundation off with those wipes. It doesn't only clean but also nurtures the skin. Would I recommend this product? YES, I would definitely recommend this product if you wear a lot of make-up and have skin issues. To those who think it's too expensive, I get ya, but I believe in investing in your skin. A cheap bargain now may help you end with terrible skin in the future, when you're older.